Each month the Anoka Knights of Columbus choose a family that models Christian family values and visibly live by them every day. The family chosen for December 2018 is the Greg and Angela Burnes. The Burnes family have been members of St. Stephen’s Catholic Church since 2004. They have five children. 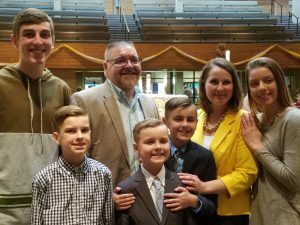 Their eldest son attends the University of Kansas, their daughter attends Totino-Grace High School and their three younger sons are attending St. Stephen’s School. The family is active in mass ministries including the Liturgy of the Word, music and serving. They also volunteer at church and school events. Angela passionately serves as the volunteer coordinator for the Totino-Grace Eagle Foundation. This program assists families with Catholic education expenses. St. Stephen’s Church and School along with Totino-Grace High School have provided priceless blessings in the forms of faith, sacraments, support and education. Family members are often reminded that they are to use their unique God given talents to serve in return with gratitude and joy.